Los Angeles (AFP) - Kawhi Leonard returned to the lineup to score 25 points as the Toronto Raptors improved their league-best record to 11-1 with a 114-105 win over the Sacramento Kings on Wednesday. Leonard, who missed the last two games with a sore ankle, also added 11 rebounds for the Raptors, who have won five straight since losing to Milwaukee on October 29. Leonard started slowly but then found his form. The two-time all-star scored 10 points in the second quarter and 10 in the third. He made a clutch three-pointer in the fourth after Sacramento had taken a seven point lead, 106-99. Willie Cauley-Stein and Buddy Hield scored 24 points apiece for Sacramento. De'Aaron Fox added 20 points, and second overall draft pick Marvin Bagley had 13. Ben Simmons flirted with a triple double, finishing with 16 points, 10 rebounds and eight assists for the 76ers, who were 6-0 at home and 0-5 on the road coming into Wednesday's contest. "We finally put it together," said Australia's Simmons. Philadelphia had lost all their away games by an average of 15.2 points. They had also lost eight consecutive contests in Indiana dating back to 2013. "I'm excited that we got our first road win this year," coach Brent Brown said. "We were pleased to get a win, especially after a performance we wanted to forget." The win came three nights after Philadelphia got clobbered in Brooklyn, losing by 25 points. Like the 76ers, the Pacers were also coming off a loss, 98-94 to the Houston Rockets on Monday. 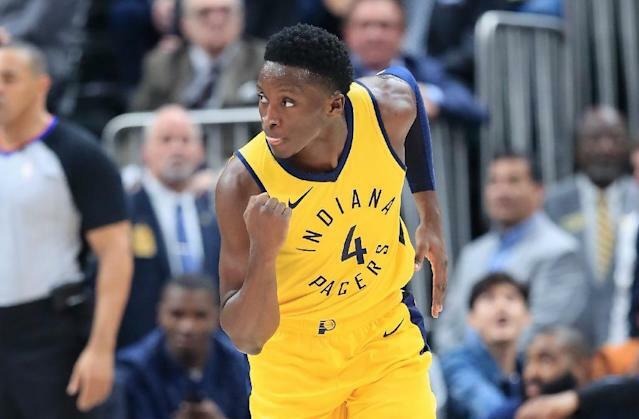 Victor Oladipo scored a season high 36 points, including 24 in the first half. He added seven assists and three blocks. The two teams are a long way from what they were when the met in back-to-back championship series in 2013 and 2014. The Heat, then featuring LeBron James, triumphed in 2013 before the Spurs, then led by Tim Duncan, turned the tables in 2014. Australian Patty Mills came off the bench to score 20 for San Antonio but the Spurs dropped their second straight. DeMar DeRozan added 18 points on six-of-15 shooting but LaMarcus Aldridge scored just six points, connecting on two of 14 attempts from the field. In the late game, James scored 24 points, 10 assists and nine rebounds as the Los Angeles Lakers held on to beat the struggling Minnesota Timberwolves 114-110 at Staples Center.